Alter Bridge aligns the original Creed lineup of guitarist Mark Tremonti, drummer Scott Phillips, and bassist Brian Marshall with vocalist Myles Kennedy, formerly of late- '90s modern rock hopefuls Mayfield Four. The resulting One Day Remains retains some Creed-isms, like Tremonti's foot-on-monitor-wedge showboating, or the thickheaded riffs that unfold smoothly into elegiac, radio-ready choruses (Creed diehards are going to love "Open Your Eyes"). But Kennedy isn't nearly as melodramatic as Scott Stapp was, and his reaching back to wail like vintage Chris Cornell fits nicely with Alter Bridge's more aggressive moments. Witness the chunky PRS shredding of "Metalingus," the Metallica influence in "Watch Your Words," or the slaves and bulldozers of pounding opener "Find the Real." Principal writers Tremonti and Kennedy don't shy away from spiritual generalizations -- believing in the promise of a new day, for example, in "Burn It Down." There's also the dualistic quality of the band's name and album artwork, as well as a fold-out poster emblazoned with the title track's lyrics. "When every wound has been opened/And in this world of give and take you must have faith." 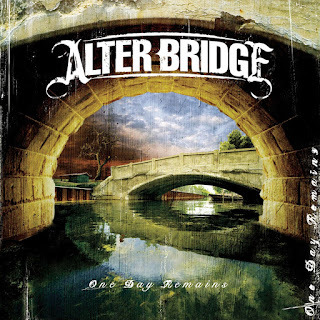 This stuff muddies the line between old group and new; together with flourish-laden post-grunge pacesetters like "Broken Wings," "In Loving Memory," and "Shed My Skin," it suggests Alter Bridge is happier courting Creed's constituency than establishing the promise of its more metal side.